You have to wonder what the founders of Pompeii were thinking when they sited their city next door to a volcano. Of course, you could say the same thing about Apalachicola, Florida. Apalachicola isn’t in the shadow of a volcano, but the Gulf Coast of Florida is still perilous. During the 1800s, a storm wiped out Port Leon, east of Apalachicola. To the west, Yellow fever turned Saint Joseph into a ghost town. Apalachicola survived both disasters. More recently the town was pummeled by Hurricane Michael during 2018. Apalachicola got up, dusted itself off, and commenced recovery, trying to get back to the business of being Apalachicola. Part of that business was hosting the Apalachicola Oyster Cook-Off, just three months after Michael. 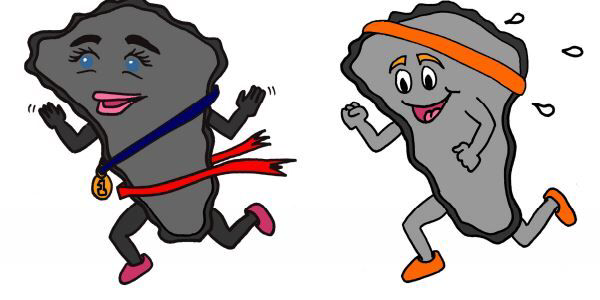 And the 2019 Apalachicola Oyster Cook-Off included the sixth annual Half-Shell Hustle 5K. Noble Davidson won the 3.1-mile race, running 20:43. For the second year in a row, Eden Keene was the women's champ, successfully defending her 2018 title with a 23:16. The race started on Saturday morning, 19 January 2019. When Davidson crossed the finish line in 20:43, he was still in sight of the runner-up, Daniel Kirkland. At 20:51, Kirkland was in turn just ahead of the third-place runner, Jason Timbert. Timbert was the top master runner in the race, posting a 20:57. Genee Meleski was the first woman master and second female finisher in the Half-Shell Hustle, placing ninth overall in 23:38. Meleski was a past champion of the Half-Shell Hustle, having been the first woman in the 2017 race. Laura Berringer took second in the women's standings, coming in fourteenth overall in 25:22. 102 athletes finished the 2019 Half-Shell Hustle.